Hennepin Avenue South. 17.5 acres. The main parkway link from the city — Loring Park — to Lake Harriet was supposed to be Hennepin Avenue. The park board spent considerable effort and money to establish Hennepin Avenue as a parkway, beginning in 1884, but it was too heavily used as a commercial route and thoroughfare to be the beautiful and tranquil parkway the park board desired. Instead, Charles Loring created a route to Lake Harriet out Kenwood Parkway, then around Lake of the Isles and Lake Calhoun, an integral part of what would become the Grand Rounds. The park board returned ownership of Hennepin Avenue South, from Lyndale to Lake Street, to the city in 1905. I’ll write more of the Hennepin Parkway story eventually. Hiawatha Triangle. Minnehaha Avenue and East 32nd Street, 0.5 acre. Purchased September 6, 1910 for $2,975. In 1960, the City Planning Commission informed the park board that the triangle was to be rezoned, probably as residential. I don’t know if that played a role in the subsequent sale of the property. On September 7, 1960 the park board accepted bids on several parcels of land, including an oral bid by Lawrence Hauge of $35,500 for Hiawatha Triangle, or Lots 1-4 of Block 7, Rollins Addition. Hauge’s bid was accepted. He purchased the land for what became McDivitt-Hauge Funeral Home. Hillside Triangle. Hillside Avenue and Logan Avenue North, 0.6 acre. Transferred from the city council September 20, 1892. The park board granted a request from the school board to use the triangle as a playground for Lowell School in 1921. Title for the land was transferred to the school board in 1953. Lowell School closed in 1974. Houses were built on the former triangle and school site. Iagoo Triangle. Hiawatha Avenue and East 45th Street, 0.05 acres. Donated to the park board by William Adams and wife, March 17, 1886, along with Osseo Triangle. The triangle was named for the story-teller in Longfellow’s The Song of Hiawatha. Sold to the Minnesota highway department in 1966 for the proposed Highway 55 freeway. The purchase price is not contained in park board records. Kenwood Triangle. Penn Avenue South, Oliver Avenue South and West Franklin Avenue, 0.02 acre. Transferred from the city council to the park board June 3, 1907 when Kenwood Park was acquired. This is another triangle still on park board books, but listed as “paved.” The traffic intersection was altered in 1981, when the park board and school board collaborated on the construction of the recreation center attached to Kenwood School. LaSalle Triangle. LaSalle Avenue and 13th Street South, 0.05 acre. Transferred to the park board from the city council June 7, 1922. The triangle was returned to the city in 1976 as a part of street reconfiguration. Longfellow Field I. Minnehaha Avenue and East 26th Street, 4 acres. Purchased in 1911 for about $7,000. Sold in 1917 for $35,000. That’s only the beginning of the story. Read the rest and see more photos here. Lowry Triangle. Hennepin, Lyndale and Vineland Place, 0.16 acre. Transferred from the city council November 28, 1891. Lost to I-94 in 1964. See much more detail here. The highway department’s initial offer of $1,500 for the triangle was rejected by the park board and the board instructed its attorney to oppose that valuation in court. By September 1967 the offer for the triangle had increased to $5,000 and the park board still wasn’t biting. Park board proceedings and annual reports never reported the final sale price of the property. Someday I’ll look through Hennepin County records to see what I can find. Lyndale Avenue North. 16.65 acres. Lyndale Avenue North was intended to be the primary parkway into North Minneapolis in what later became known as the Grand Rounds. It was too much a commercial avenue ever to serve the purpose of a parkway connecting Loring Park to Farview Park, however. After twenty years of trying to make it a parkway between Western (Glenwood) Avenue and 29th Avenue North, the park board gave up and turned it over to the city to maintain as an ordinary street in 1905. The park board abandoned Hennepin Avenue South at the same time. Lyndale Farmstead (partial). The half-block south of West 40th Street between King’s Highway and Colfax Avenue, 1.78 acres. Acquired from James J. Hill and Thomas Lowry in 1909 as part of the land donated for a superintendent’s house. Theodore Wirth recommended selling the land in the 1912 Annual Report and using the proceeds to build a laundry at the Lyndale Farmstead shops for washing the napkins and table cloths from park refectories, and towels and swimming suits from the bath houses. Other uses were later proposed for revenue from the sale of the 14 lots platted there. In 1922 the board decided to sell the lots, asserting that no park use was ever intended for that land. All of the lots were sold by 1925. Annual report figures for those years only show revenue of $17,155 from land sales, but that likely understates total revenue as the lowest listed sale price I can find for any single lot was $1,750. All revenues from sales went into a fund for the operation and improvement of Lyndale Farmstead. Curiously, in the midst of the sale of those lots, Wirth published a plan for the improvement of Lyndale Farmstead in the 1924 Annual Report that included building four tennis courts at the corner of King’s Highway and West 40th St.
Market Square. Main Street and today’s Central Avenue. Transferred to the park board April 27, 1883. The city council had acquired the land in exchange for the assistance it had provided in constructing a dam to protect St. Anthony Falls. On January 22, 1886 the city council voted to cede the land to the Minnesota Industrial Exposition as part of the ground to be used for an Industrial Exposition Building. Midway Triangle. University Avenue and Bedford Street SE, 0.03 acre. Acquired from the city council, October 1, 1919. 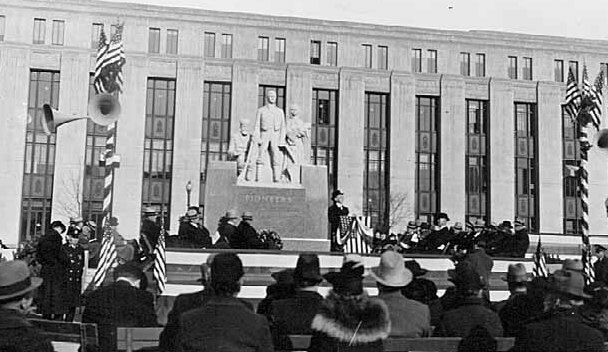 The park board noted at its meeting November 1, 1944 that the triangle had already been paved over as part of the widening of University Avenue and, therefore, transferred title back to the city council. See more detail on this and other Prospect Park triangles here. Mississippi Park. Land was lost on both sides of the Mississippi River when the Meeker Island Dam and later the Ford Dam were built. The park board also lost several islands in the river, including Meeker Island, which were submerged in the reservoirs behind the dams. The story of the construction of the dams and their impact on Minneapolis parks deserves more detail than I can give it here. The west side of the river gorge from Franklin Avenue to Minnehaha Park should be named for Horace William Shaler Cleveland, the man who did so much to ensure that the river banks became a park. Oak Street Triangle. Officially part of East River Parkway at Oak Street, but known as Oak Street Triangle. Sold to U of M in 1961 for a price that is not recorded in park board records. Osseo Triangle. Hiawatha Avenue and East 46th Street, 0.03 acres. Donated by William Adams and wife, March 17, 1886 along with Iagoo Triangle. In keeping with the Longfellow theme in the neighborhood named for him, the triangle was named for another character in The Song of Hiawatha; Osseo was the Son of the Evening Star. Sold to Minnesota Highway Department for Highway 55 freeway in 1966 for an unknown price. Pioneers Square. Marquette Avenue and Second Street South, across from the post office, 2.5 acres. The land was purchased and developed by the park board at the request of the city council. The U. S. Postal Service wanted to construct a new post office in downtown Minneapolis, but insisted that it be set in attractive environs, a park. The park board rejected the plan of the city council to assess the nearly half-million dollar cost of acquisition, demolition and improvement mostly on the surrounding property owners at the onset of the Great Depression in 1930. The park board finally agreed to the deal in 1932 when the city council authorized $320,000 in bonds to cover about 80 percent of the cost of the land. The remaining costs were assessed on property owners. The Pioneers Statue being assembled in front of the new post office. The new post office and Pioneers Square — and The Gateway, a couple blocks west — did not lead to urban renewal in the area. (With the snow melt at the end of the winter of 1953, maintenance crews picked up 70 bushel baskets of empty wine and whiskey bottles from The Gateway. One Monday morning in the summer of 1953, crews picked up 62 empty wine and whiskey bottles from the grass at Pioneers Square. [Charles E. Doell Papers, Hennepin History Library]) The city condemned Pioneers Square and The Gateway in 1960 in a new round of urban renewal. 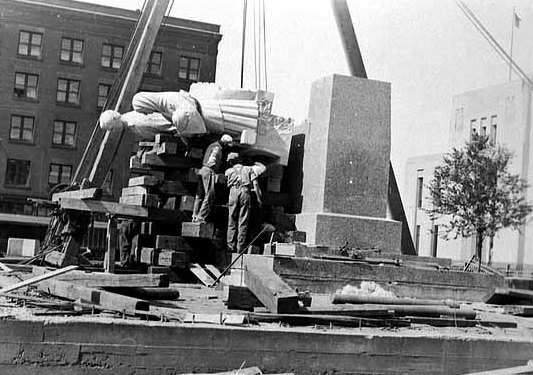 The Pioneers Monument was moved to a small triangle in northeast Minneapolis in 1967, which the city sold to the park board for a dollar. The statue was moved across Marshall Avenue to the B. F. Nelson park site in 2011. I’ll post Lost Minneapolis Parks: The Complete List, Part III soon. Do you remember anything about any of these former parks? If you do, send me a note so we can preserve some recollection of them.